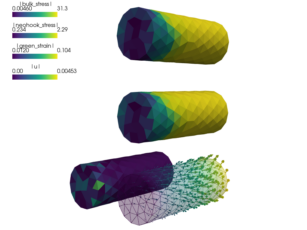 Nearly incompressible hyperelastic material model with active fibres. Large deformation is described using the total Lagrangian formulation. Models of this kind can be used in biomechanics to model biological tissues, e.g. muscles. The first term is the neo-Hookean term and the sum add contributions of the two fibre systems. The tensors are defined by the fibre system direction vectors (unit). The physical domain coordinates where the parameters shound be defined. 'n_step' : 21, # has precedence over dt!